We provide a holistic approach to financial planning, more than just selling products. Mutual funds offer a convenient way to participate in a variety of market activity that would be difficult for most investors to achieve by purchasing individual securities. With almost 8,000 funds available on the U.S. market, you should be able to find appropriate investments to pursue your goals.2 However, it’s important to periodically examine the mix of funds you hold. If you are approaching retirement or already retired, this may be a good time to assess the risk level and growth potential of your funds, along with any other investments in your portfolio. Keep in mind that even though it is generally wise to reduce risk as you near retirement, you may also need to pursue long-term growth opportunities. The following overview describes some basic types of funds in rough order of risk, from lowest to highest. Investments seeking to achieve higher returns also carry an increased level of risk. Money market funds invest in short-term debt investments such as commercial paper and certificates of deposit and are typically used as a cash alternative. Although a money market fund attempts to maintain a stable $1 share price, you can lose money by investing in such a fund. Money market funds are neither insured nor guaranteed by the FDIC or any other government agency. Municipal bond funds generally offer income that is free of federal income tax and may be free of state income tax if the bonds in the fund were issued from your state. Although interest income from municipal bond funds may be tax exempt, any capital gains are subject to tax. Income for some investors may be subject to state and local taxes and the federal alternative minimum tax. 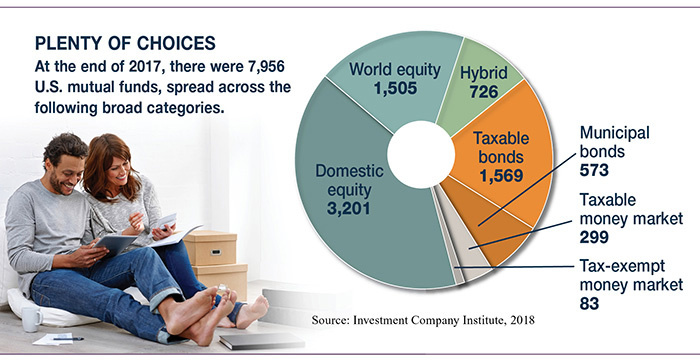 Income funds concentrate their portfolios on bonds, Treasury securities, and other income-oriented securities, and may also include stocks that have a history of paying high dividends. Balanced funds, hybrid funds, and growth and income funds seek the middle ground between growth funds and income funds. They include a mix of stocks and bonds and seek to combine moderate growth potential with modest income. Growth funds invest in the stock of companies with a high potential for appreciation but low emphasis on income. They are more volatile than many types of funds. Global funds invest in a combination of domestic and foreign securities. International funds invest primarily in foreign stock and bond markets, sometimes in specific regions or countries. There are increased risks associated with international investing, including differences in financial reporting, currency exchange risk, economic and political risk unique to a specific country, and greater share price volatility. Sector funds invest almost exclusively in a particular industry or sector of the economy. Although they offer greater appreciation potential, the volatility and risk level are also higher because they are less diversified. Aggressive growth funds aim for maximum growth. They typically distribute little income, have very high growth potential, tend to be more volatile, and are considered to be very high risk. Bond funds (including funds that contain both stocks and bonds) are subject to the interest-rate, inflation, and credit risks associated with the underlying bonds in the fund. As interest rates rise, bond prices typically fall, which can adversely affect a bond fund’s performance. U.S. Treasury securities are guaranteed by the federal government as to the timely payment of principal and interest. Dividends are not guaranteed. Asset allocation and diversification are methods used to help manage investment risk; they do not guarantee a profit or protect against investment loss. Mutual fund shares, when sold, may be worth more or less than their original cost. * David A. Scott offers securities and investment advisory services offered through SagePoint Financial, Inc., Member FINRA/SIPC and a Registered Investment Advisor. Insurance services and tax and accounting services are offered through Scott Financial Services, Inc. which is not affiliated with SagePoint Financial, Inc., or registered as a broker-dealer or investment advisor. SagePoint Financial, Inc. does not offer tax or legal advice. All other listed entities are unaffiliated. This communication is strictly intended for individuals residing in the states of DC, FL, GA, MS, NM, NV, SC, TN and TX. No offers may be made or accepted from any resident outside the specific state(s) referenced.